I was happy to stare down my longtime nemesis, caramelizing sugar, in the syrup stage of this recipe. It worked the first time! The burnt sugar syrup lends a beautiful color to the cake, and a very distinct flavor that works well with the maple. 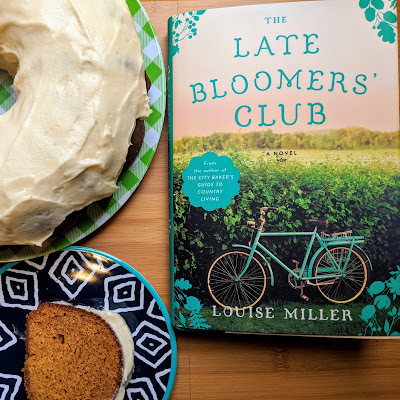 If you like stories about relationships and towns like Stars Hollow, you should definitely check out Louise Miller's books. 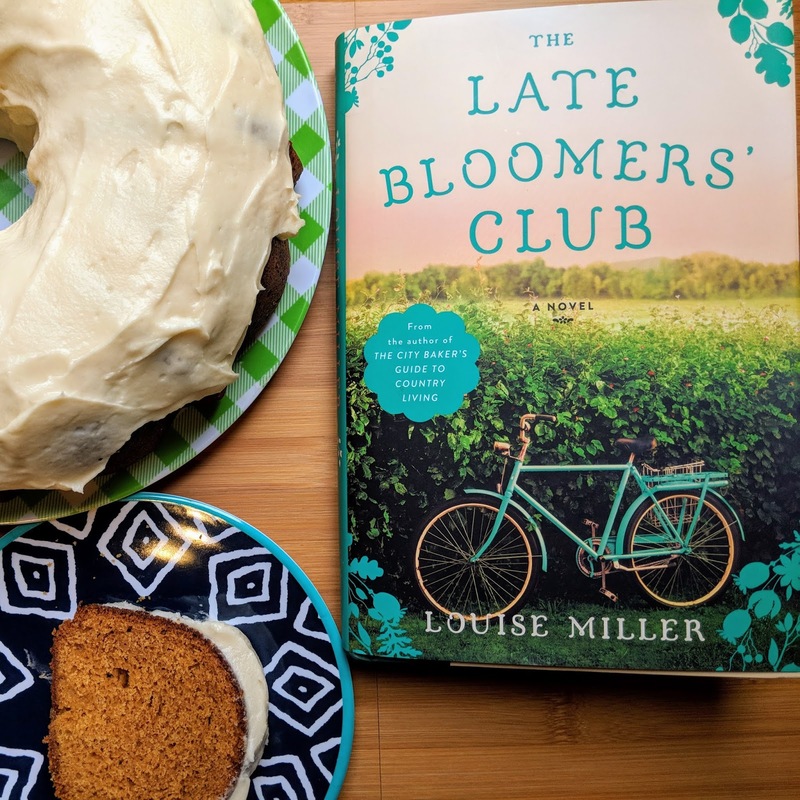 The Late Bloomers' Club is more about the town and the relationship between two sisters, while The City Baker's Guide to Country Living is more focused on romance. Both are great reads and both have a lot of baking in them. The author, a pastry chef, can be followed in Instagram. A quick note: Never walk away from sugar syrup and never touch it. Caramelizing sugar is an extremely hot process. Please use caution. Place the sugar evenly in a pan and turn the burner on high (a cast-iron skillet is great for this). Let the sugar melt. You don't want to stir the sugar - it will form sugar crystals and clump up - but you can gently move the pan to swirl it. The sugar will dissolve, then start to turn light brown. While the sugar is cooking, boil the water. When the sugar has turned to a golden amber color and is smoking a bit, take it off the heat. Very carefully drizzle in the boiling water. It will sputter when you do this - make sure you are wearing long sleeves. Return the pan to the heat once all the water has been added, and stir until combined. Set aside to cool. Add 1/3 of the flour mixture to the butter, sugar, and eggs, mixing just until the flour is incorporated, then add 1/3 of the sour cream/ burnt sugar mixture. Repeat until you have a uniform cake batter, taking care not to overmix. Scoop the batter into a well-greased 10-12 cup Bundt pan. In the bowl of a stand mixer, beat together the butter, salt, and confectioners sugar. Add the vanilla extract and maple syrup. Add the heavy cream 1 tbsp at a time, until the icing is a nice, spreadable consistency. Place the cake on a platter. Using an offset spatula, spread the icing over the top of the cake. *-I had maple extract in my pantry so I used 1 tsp vanilla, 1 tsp maple. ** - Knowing my Bundt pan, which is a garage sale find of the old metal variety, bakes hot, I checked at 45 minutes and it was done. Know your oven, know your pan, check early so you don't overbake. *** - It's true! I added it to my cold brew coffee. **** - Again, knowing my pan and how cooling sugar crystals can merge a cake with pan, I let it cool for 10 minutes and then turned it out to cool completely. Two weeks ago, I told the story of why I'm experimenting with chestnut flour, so I won't replicate that information here. But that went well enough to keep going, and I had this brownie recipe as a must-try. This is absolutely hands down the best alternative brownie recipe I have made. Great flavor, great texture, nothing sacrificed, and in fact the flavor of the chestnut flour may even be an improvement. I can't get over how good these are. Position a rack in the center of the oven and preheat to 350 F. Line an 8-inch square baking pan with 2 crisscrossed pieces of parchment paper cut to fit widthwise, leaving an overhang on each side. This will make the brownies easy to remove from the pan. Place the butter in a small, heavy-bottomed saucepan set over the lowest possible heat. * Add the chocolate and let melt together, stirring frequently to prevent the chocolate from scorching. Continue cooking until the mixture is pleasantly warm, but not super hot, to the touch. Remove from the heat and keep warm. Sift the chestnut and tapioca flours into a small bowl and set aside (chestnut flour tends to clump, so don’t skip this step). Meanwhile, place the eggs, sugar and salt in the bowl of a stand mixer fitted with the paddle attachment and whip on medium-high speed until the mixture is very light and fluffy, 5 minutes. ** Turn the mixer to low and stir in the vanilla until just combined, then the warm chocolate-butter mixture. Add the flour mixture and mix on low until combined. Remove the bowl from the mixer and use a flexible silicone spatula to give the batter a final stir by hand, scraping the bottom of the bowl and making sure all the flour is incorporated. Scrape the batter into the prepared pan and smooth into an even layer. Bake the brownies until the top is puffed and a toothpick inserted into the center comes out with moist crumbs, 24–30 minutes, taking care not to overbake. 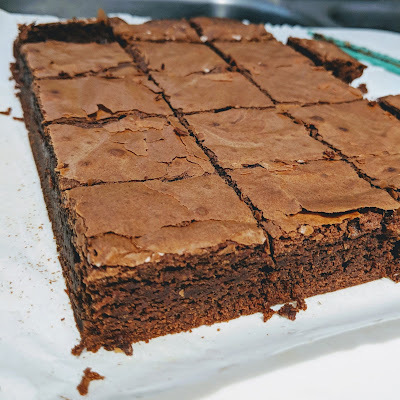 Let the brownies cool completely, then use the parchment handles to lift them out of the pan and onto a cutting board. 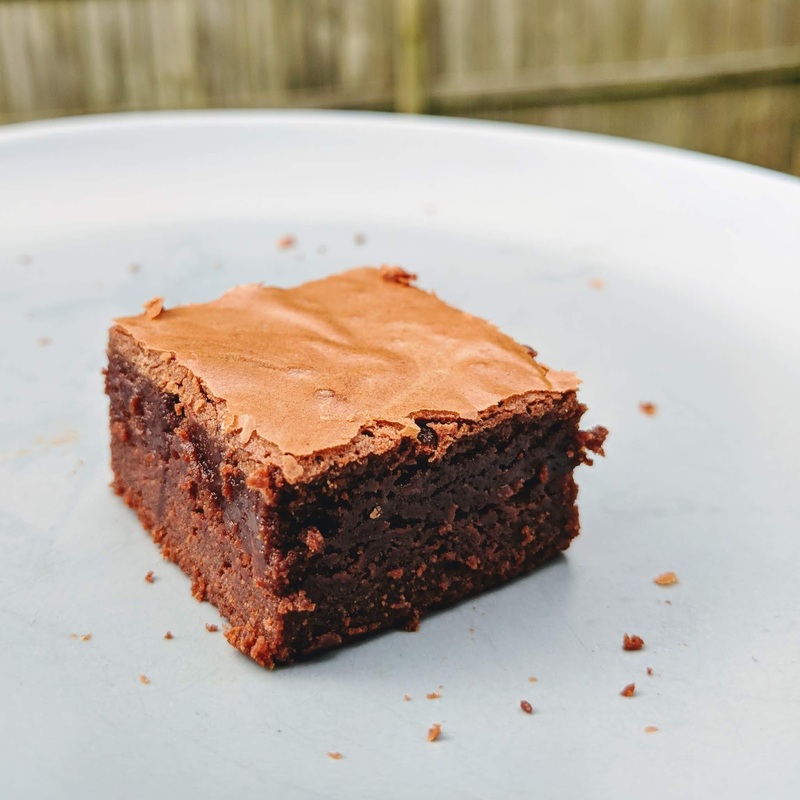 Use a sharp chef ’s knife dipped in hot water and wiped clean between each cut to slice the brownies into 16 squares. The brownies keep well, airtight at room temperature, for up to 3 days, or refrigerated for up to 5 days. *I did this in the microwave at 50% power because I'm not going to risk burning good chocolate! **Don't skip this time, at last 5 minutes. Back in 2009, I tried for a time to keep up with a separate cooking blog. It was called Jenny Also Cooks, because JennyCooks was taken. 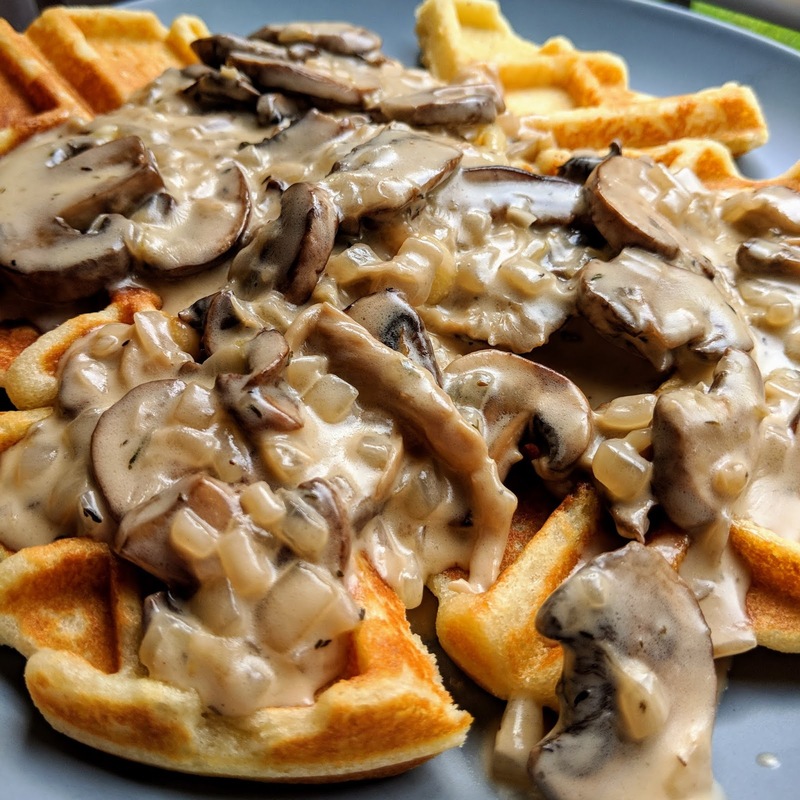 I got a request to try making a savory version of my low-carb, gluten-free, grain-free crisp waffles, and I had this memory of creamed mushrooms on waffles. 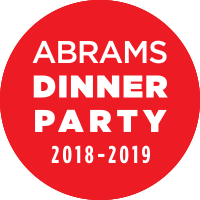 I originally posted it over on my cooking blog, two recipes from the Lee Bros. Southern Cookbook - Creamed Mushrooms and Cornmeal Waffles. You can follow that link to make the creamed mushrooms, and I will focus my posting on the savory version of the low-carb waffle, which worked great! Preheat waffle iron according to manufacturer's directions. In a large bowl, combine almond flour, tapioca starch, and baking powder. Whisk or stir to combine well. Add wet ingredients to dry and stir until combined. Use 1/3 to 1/2 cup of batter at a time and use waffle maker as directed. Although we are watching it behind the British (so no spoilers please), we are still devoted to reality baking shows, particularly The Great British Bake Off. Did you know that is called The Great British Baking Show in the USA? On Episode 4: Desserts from Series 3, the bakers are instructed to make a dessert without wheat flour. Brendan uses chestnut flour to make a Clementine and Chestnut Torte. My husband and I turned to each other and exclaimed, "Chestnut flour?" You see, my cupboards are full of gluten-free flour options. I've experimented with many alternative flours - tapioca, chickpea, rice, sorghum, coconut, and many nut flours including almond and peanut (hmm, actually, I have purchased the peanut flour; still need to use it!) But I had not heard of chestnut flour. He ordered me some and I've been looking for ways to use it. Some recipes say some helpful things about chestnut flour - that it needs to be sifted, because it clumps easily. That it is best combined with other flours because it is strong in flavor. That it causes problems similar to coconut flour in the way it absorbed liquids (this was not my experience but I've only used it once so far.) That it evokes a feeling of sweetness, and you may be able to get away with less sugar. That it should be combined with other flours. 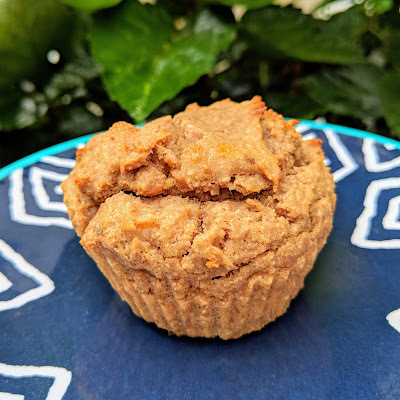 The recipe I based these muffins on used a small amount of All-Purpose flour, and I used the same amount. I think especially in muffins, that amount could be replaced with tapioca flour or one of the nut flours. I used coconut sugar in place of the sugar mentioned, and only half what was called for. I added an egg based on some of the comments. I also combined the ingredients in a different way. 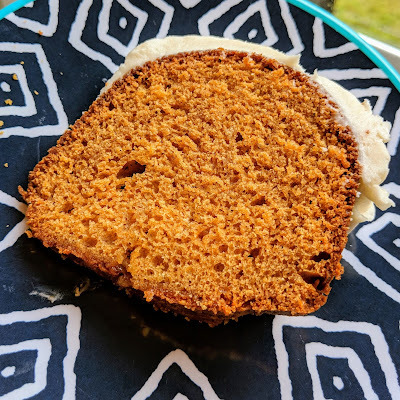 So while I will credit and link you to the originating recipe (Banana Chestnut Cake from Always Order Dessert by Alejandra Ramos), mine is really something different from it! 1. Preheat oven to 350 F. Prepare a muffin tin or silicone muffin tins. 2. Mash bananas. Stir in oil, eggs, milk, rum, vanilla extract, and coconut sugar. 3. Combine flours with spices and other dry ingredients. Mix into wet ingredients. Stir until no visible flour remains. 4. Fill muffin tins and bake for 20-25 minutes, until inside of muffins are not mushy. *Like usual, I used banana liqueur in place of the vanilla and rum, because I have a giant bottle that would never go away.